OLYMPUS OM-SYSTEM E-ZUIKO AUTO-T 1:4 f=200mm LENS. OLYMPUS OM-SYSTEM E-ZUIKO AUTO-T 1:4 f=200mm LENS IN EXCELLENT CONDITION, VERY LIGHT SIGNS OF USE THAT CAN SEE IN PICTURES BUT PERFECT CLEAN, CLEAR AND WORKING ORDER. ITEM FOR SALE :     . Box has been opened for inspection. POOR: < 70% of original condition - heavily used item. none - item is in fully working order. Item condition 25178 general item condition Item pictures. 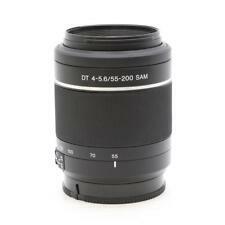 NEW SONY DT 55-200mm F4-5.6 SAM Lens for A Mount (SAL55200-2). Model: DT 55-200mm F4-5.6 SAM. Compatible Mount: Sony A mount. Comparable 35mm Focal Length: 82.5 - 300 mm. 3.12' (95 cm). Lens 948330. Lens condition. Mark in the lens. No other way available. We solve all issues by consultation. No Few Middle Large. 80-85% For Parts As-is. It does not work normally. Canon EF 70-200mm f/4 USM Zoom Lens #M24494. 1 - Canon EF 70-200mm f/4 USM Zoom Lens #M4494. This is a used Canon 70-200 F/4 USM Zoom Lens that is in Excellent Condition. This lens has very little wear from previous use. Nikon Nikkor 80-200mm 1:4.5 zoom lens. Condition is Used & Not Abused. Photos are of item for sale. What you see is what you get. Tested with Nikon D90 body. Small scratche on the built-in hood but no paint fade, no rust. -No coating separation. [Near Mint]. -Original front and rear cap. - Small dust. I send a product by. Tokina 85-200mm f/4 Macro 1:4 MF Ø55 EL Auto Lens for NIKON Non-Ai. In good condition. Made in Japan. A VERY GOOD QUALITY LENS IN GREAT CONDITION. LENS IS FROM ESTATE SALE, UNTESTED, BUT BELIEVED TO BE FULLY 100% FUNCTIONAL. Condition Classes Excellent. Excellent Pre-owned, minimal signs of use. A wide variety of rare and excellent condition's goods. Our inventory changes too frequently to update every item we carry on the website. Asahi Opt. Pentax Super Multi Coated Takumar 200mm f/4 [excellent] #298 F/S !! Asahi Opt. Grade: Excellent. I will look it for you. I will provide courteous and responsive service. There are tiny dusts inside the lens. I participate from Japan. So I can provide you the best service. Appearance is beautiful, scuffs from normal use. ■ Functional. There is a few tiny dusts. It shows signs of use. There is no separation. Tiny scuffs from normal use. ■ Functional. There is no fungus. I send a product by EMS. This lens is good. Lens&Optical system. There are tiny dusts inside the lens. There is no fog on inside of the lens. This lens works fine with no problems. You can enjoy taking photos with the lens in good condition. EXCELLENT CONDITION. NO DEEP SCRATCHES OR SCUFFS. PHOTOS SHOWN ARE OF THE ACTUAL ITEM FOR SALE. NO RON LENS CAP OR BACK LENS CAP. This lens is for MINOLTA SR-Mount. Model : 75-200mm f/3.8 Zoom. I am not sure if it has any impact on the finish of a photo. Condition : Used ! Serial number : 1005546. RANK: Optical MINT. Beautiful condition. (Optical Top Mint). Lens number: #508760. # Functional "Lens" Lens Filter. MINT Pre-owned, like New. Near Mint Minimal signs of use. All you can see on the picture will be included in a set of a package. Please refer to the pictures for more details. Please check the pictures and don't hesitate to ask any questions about the item ! Thank you. .
SIC - Super Integrated Coating, improved multicoating applied to lenses since around 2000. This lens has been tested on a Nikon D2Xs. All functions are working properly; VR, Auto-Focus, Manual Focus, Aperture, and Zoom. The lens is in good condition. The barrel shows moderate signs of prior use. It is a good lens. I tested the lens and it is perfect in focus. Open and close perfectly and smooth. Lens focus ring turns smooth, but a bit stiff. Fits Canon AE-1 or others that take a FD screw in lens. Excellent condition. Item model number: SAL55200. SONY 55-200MM F/4-5.6 Lens. ED (Extra-low Dispersion) Glass for sharp imaging. Give us a shot and we will make sure that you will look to us again! Compact and lightweight, easy to carry everywhere. ■ Canon FL 200mm f3.5 FL-Mount MF Lens ■. A NEW Never been used. Serial No.40904. For Asia: USD35. Used ( For Repair). As Is. There is many fungus. Everything is shown on the pictures. I will do my best to solve the problem with you. Works Properly. Lens Cap (Front & Rear). This lens is beautiful. ■ Appearance. ■ Functional. - No fungus. OLYMPUS OM-SYSTEM E-ZUIKO AUTO-T 1:4 f=200mm. Visually there are no mold or scratches on the lens. Zoom is OK. There is no scratch or dent on the appearance. There is no fog. Nikon AF-S DX VR Zoom-Nikkor 55-200mm f/4-5.6G IF-ED Lens. F/S From Japan #952. There are little dusts inside the lens. tiny scuffs from normal use. There is no scratches. There is no fog. It shows signs of use. Our item number C938. CANON ZOOM LENS FD 100-200mm 1:5.6 S.C. CANON LENS MADE IN JAPAN Nice Canon Zoom Portrait Lens with Canon Sprectra Coating 100-200mm f/5.6 straight through. Appears like it has never been used. Canon Zoom Lens FD 100-200mm 1:5.6 S.C. Camera Lens~ Very Nice!! Just a Great Lens! Rear Cap only! There is no haze on inside of the lens. It has no fungus on inside of the lens. Optical system: CLEAN GLASS! It has light scratch on the hood. Perfect Inspection by Japanese Staff with High Skills. Type: Zoom lensBrand: CanonSeries: Canon "L"
CANON LENS. Canon EF-S 18-200mm f/3.5-5.6 IS Zoom Lens. KODAK LENS. SAMSUNG LENS. NIKON LENS. CASIO LENS. Mount Canon IS. Product Line Canon EF-S.
Beautiful Tokina Zoom lens for Minolta. It has no thread fungus on inside of the lens. Optical system:(Lens, finder, mirror, focusing screen, Accessories Ex filter, etc. ). Function:(Lens, finder, mirror, focusing screen, Accessories Ex filter, etc. ). Tamron 28-200mm f/3.8-5.6 AF 171D AF Aspherical LD Lens for Sony. This is a used Tamron 28-200mm F/3.8-5.6 AF Lens for Sony that is in Good Condition. 1 - Tamron 28-200mm Lens for Sony. The barrel shows minimal wear and is in good shape overall.